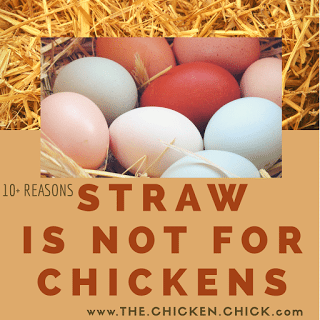 Long strands of golden straw make a lovely, rustic-looking nest for photographing eggs, but straw does not belong in backyard chicken coops for a variety of reasons we’ll look at here. 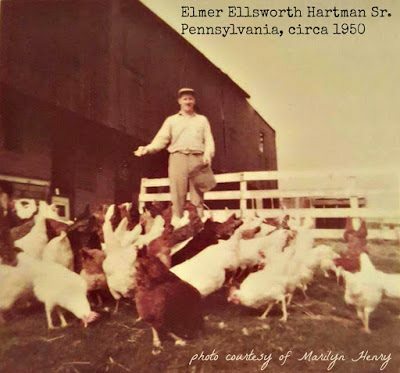 In the first half of the 20th century, chickens were undoubtedly the least valuable barnyard animal; their health, nutrition and management needs were not well understood by farmers and didn’t need to be- if a chicken got sick, they were simply served for dinner and easily replaced. The valuable, four-legged farm animals such as calves and foals had their barn and stall floors lined with straw to sleep on, hence the term “bedding.” Since there was a plentiful supply available, farmers tossed straw onto the floor of the chicken coop and stuffed into next boxes without a second thought about performance. 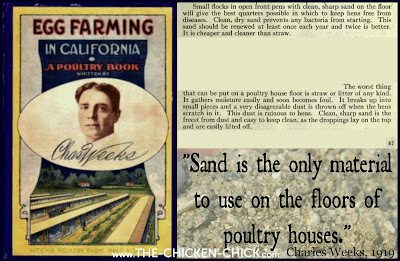 Meanwhile, true poultry farmers whose livelihoods depended on having healthy, productive chickens were using sand for litter. 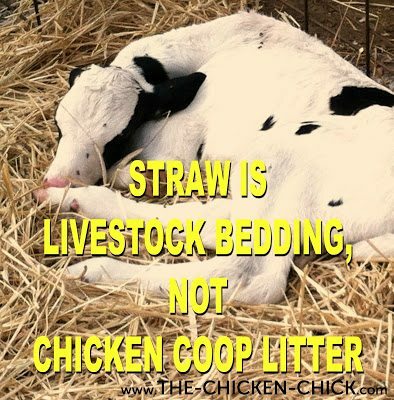 While livestock need bedding for a layer of protection between them and the cold, damp floor while they sleep, chickens do not sleep on the ground, they sleep on roosts, therefore, they do not need bedding- chickens need litter on the floor of the coop to manage waste. Straw is not absorbent, molds easily, mats & harbors insects. Chicken coop litter is intended to keep the coop dry and to aid in waste management. Straw performs neither of those tasks well. Straw is not absorbent, therefore, any water spilled onto it pools underneath, creating an environment ideal for mold, fungal and bacterial growth which leads to disease, bumblefoot, frostbite, parasites, flies, unnecessary work, and expense. Controlling moisture is a constant battle in a winter chicken coop. Moisture from droppings and moisture produced from chickens’ high respiratory rates is a challenge to keep up with even in a well ventilated winter chicken coop as evidenced by condensation on the windows in some coops early in the morning. Moisture created from respiration and droppings dampen the surface of straw, which fosters the growth of molds, fungi and bacteria that cause respiratory illness and diseases such as Aspergillosis in chickens. 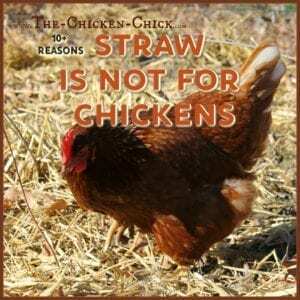 Not only does straw not perform well to keep a coop dry, it actually complicates waste management. 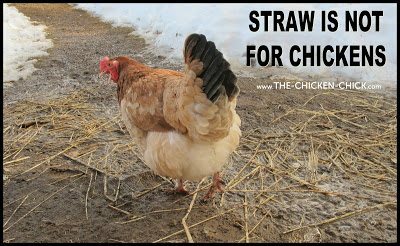 As stated by author Gail Damerow in Storey’s Guide to Raising Chickens, [s]traw, unless it’s chopped, mats too easily and, when it combines with manure, creates an impenetrable mass.” Soiled straw is difficult to remove, which also weighs against its use since chicken keepers are less apt to clean a coop as often as necessary if the chore is burdensome. Peter Brown, aka The Chicken Doctor, states, “I don’t like straw or hay. These kinds of things are not appropriate (as chicken coop litter) at all. 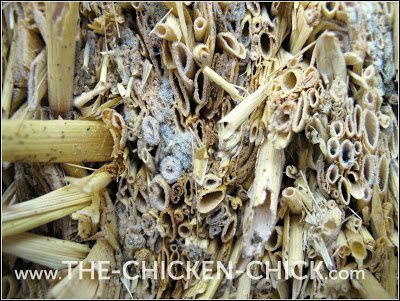 They don’t absorb moisture, they mold very easily and many times, when you get them, they’re moldy.” The hollow core of straw serves as a cozy sanctuary not only for mold, but for insects including mites and other parasites chickens would rather not have hauled into their sleeping space. Baled straw should never be placed inside a winter chicken coop for insulation. Even with the best ventilation practices, moisture from respiration and droppings create humidity inside a winter chicken coop. (see hazards of moisture on straw, above) This humidity is most noticeable inside an inadequately ventilated winter coop first thing in the morning when windows are coated with condensation, even ice. 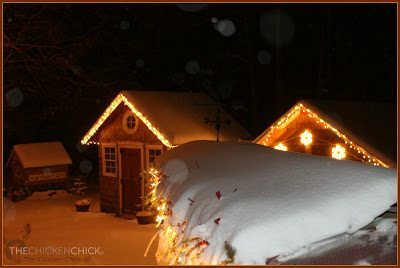 A properly insulated and ventilated chicken coop will be sufficient protection from cold weather and wind. 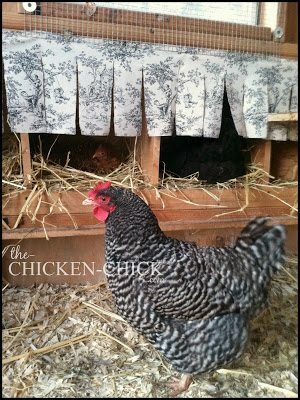 If you must insulate the coop using straw bales, place them against outside walls of the coop. A better option is the use of sand as litter. 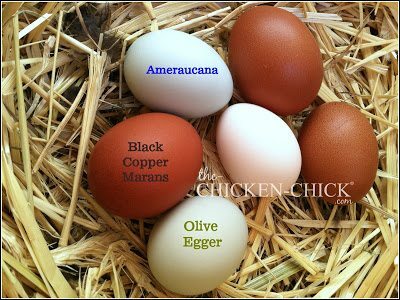 Winter chicken coop temperatures are kept more stable in cold weather and hot weather using sand as litter due to its high thermal mass. 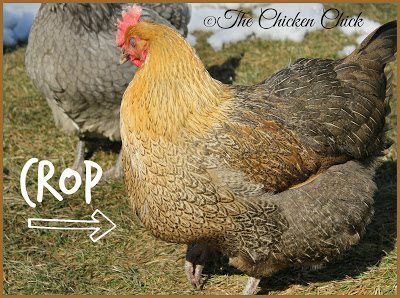 A common yet specious claim about using straw in chicken coops is that it makes a chicken coop “warmer in the winter by trapping warm air inside its hollow center.” The truth is that the temperature inside straw will be the same as the air temperature inside the coop; cold air inside a coop means cold air inside straw. Straw does not possess a magical ability to turn cold air into warm air. Again, sand is a better litter choice than straw. In the heat of summer, hot air inside the coop is retained inside straw’s hollow core. Straw’s presence in a hot summer chicken coop is dangerous to chickens already struggling to stay alive given their limited thermoregulatory mechanisms in hot temps. When I began keeping chickens, I thought I was supposed to use it in the nest boxes without really thinking about the purpose of lining nest boxes, which is to protect eggs from breaking as they drop out of a hen’s vent. I quickly found that hens scratched and kicked most of the straw out of the nest boxes, leaving a hollow in the center of the box exposing bare wood, which obviously rendered the eggs unprotected from breakage. 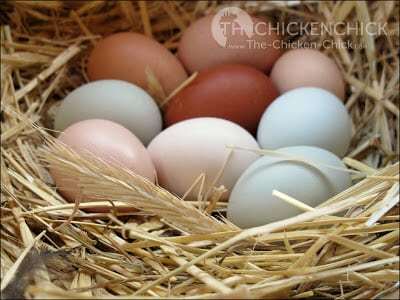 For effective egg protection, see the suggested solutions here. In a wet chicken yard, (and coop) straw soon begins decomposing, becoming a foul-smelling, rotting mess of poop and mud- the ideal environment in which pathogens such as coccidiosis thrive. 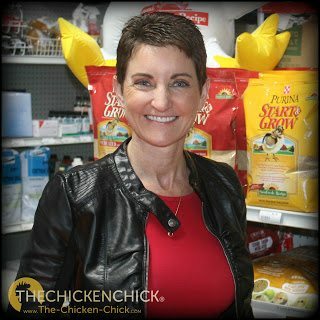 With pine shavings, sand and chopped varieties of heat-treated hay/straw/zeolite readily available to today’s educated chicken keeper, there’s no reason to put chickens at risk by using straw in chicken coops. 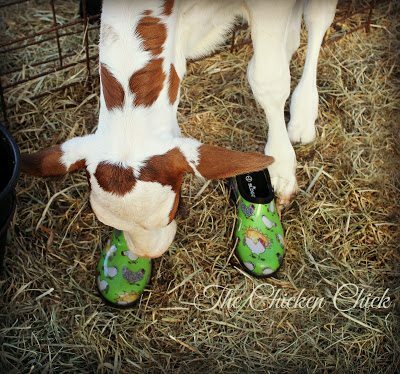 Save the straw for egg photo shoots, calf bedding and decorating the autumn chicken yard! If you don’t recommend straw or wood shavings, what material is best to put in the nesting boxes for the chickens to lay their eggs on?